The Edmonton Service Centre is the location for permits, passes, payments, licences and more. Located across from Rogers Place on the 2nd floor of Edmonton Tower at 10111 104 Avenue, the centre is on major transit routes and fully accessible. There are a range of options to get downtown to the Edmonton Service Centre. Pay parking is available in Edmonton Tower and in the vicinity. 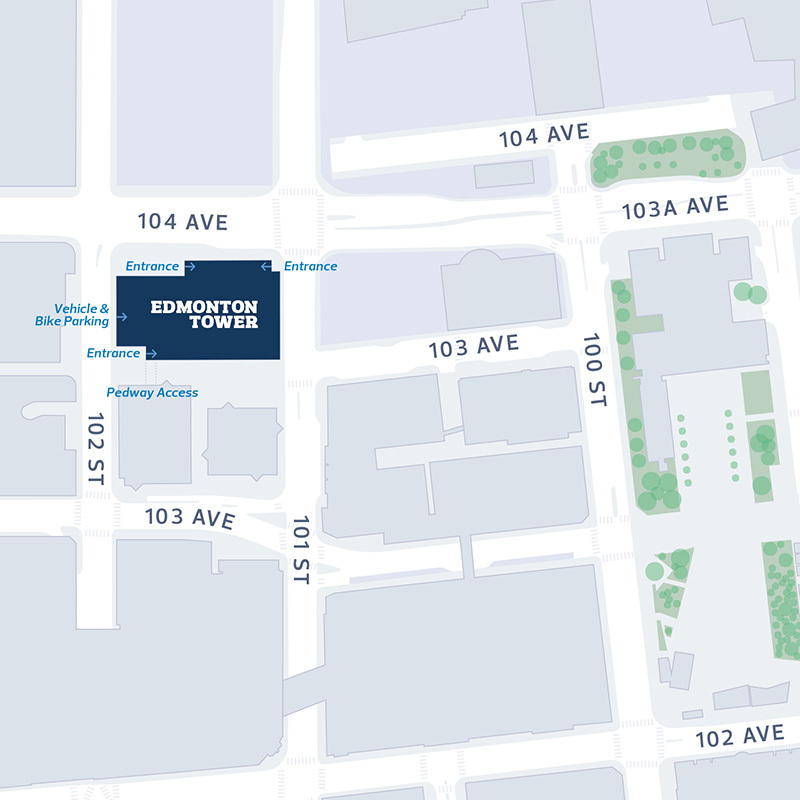 Our map graphic shows parking and pedestrian access to Edmonton Tower. When you arrive at the Service Centre, greeters are on hand to help you. There are five check-in kiosks where you can select the service you want. These kiosks are conveniently located near the escalators and elevators. When you selected the service you want, the kiosks will generate a ticket directing you to a service counter. When you receive your ticket, it will provide the wait time for your service request. There is a large, comfortable waiting area for your convenience. The City of Edmonton now offers a variety of services online as an alternative to visiting the Edmonton Service Centre. Online business licence renewal service is available to licence holders who have no changes to their business licence account. License your pet online. You can also update your contact information, make changes to your licence, or cancel it if you no longer have pets. A City of Edmonton search of records, used to retrieve filed information or plans relating to the construction and development of a property, can now be applied for online. Apply online for a report from the City of Edmonton confirming that all buildings and structures identified on the property have met the regulations under the Zoning Bylaw and have the appropriate development permits. With eServices, apply and check the status of your application 24 hours a day, 7 days a week, from your computer or other smart device, no matter where you are. Pay bylaw tickets through a secure payment process. Buy ETS day passes, ticket packs and monthly passes. A comprehensive list of all City online services is available at 311 Online. Note: The centre is closed on statutory holidays. These services are available at the Edmonton Service Centre. ETS passes, tickets, route information and ETS Lost and Found. Property taxation information and payments. Application processing, payment, and approval for home construction projects. Application processing, payment, approval and records management. Applications and program eligibility information. Application processing, payment, licence approval, and records management. Information, permits and inspections for lot grading, water and sewer servicing and flood prevention.